Rod Blackstone joins the Power in 2019 as the team's Director of Fun. CHARLESTON, W.Va. (January 15, 2019) - In preparation for their 15th season and the 2019 South Atlantic League All-Star Game at Appalachian Power Park, the West Virginia Power has signed a key free agent with limited skills on the mound or at the plate. Power Managing Partner Tim Wilcox announced today that the front office team has brought on Rod Blackstone, who recently completed nearly 16 years as the Deputy Mayor of Charleston and is even better known as "Toastman" in town and around minor league baseball. "The All-Star Game and the new affiliation with the Seattle Mariners mean that 2019 will be a season of tremendous promise and some important transitions," Wilcox said. "With Rod's unlimited enthusiasm for Power baseball, his connections throughout our community and understanding about how fun minor league baseball can be, his experience and positive attitude will make a difference for us." Blackstone became a free agent last week when Charleston Mayor Danny Jones retired after four terms. He will serve as a consultant for the front office staff to work on plans for the SAL All-Star Game, help build the team's sponsorship base, improve connections with fans, businesses and organizations and try to make the ballpark experience more fun and memorable for anyone who comes to Appalachian Power Park. On game days, he will still be found leading cheers, making toast, plotting other ways to distract opponents and joining the fun with fans in and around the Toast Section and Rowdy Alley. "Rod was the best free agent out there for us, even if his fastball only tops out at 41 (on a good day) and his batting average was only .243 in his last year playing church softball," added General Manager Tim Mueller. "No one engages fans in the fun of the ballpark better or shares a more contagious joy for minor league baseball in the stands and beyond, and that's why he signed quicker than Bryce Harper and Manny Machado this off-season." 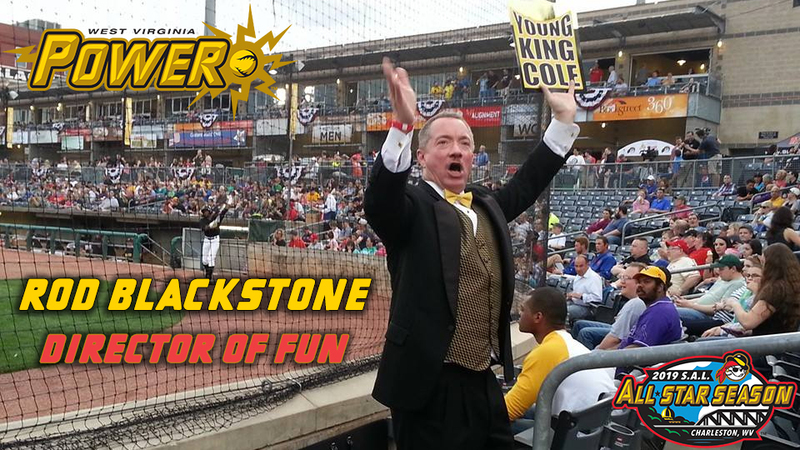 "I've always been very serious about how much fun it is to be at a Power game with family and friends, and I'm very much looking forward to the opportunity to make the future of Power baseball more fun, vibrant and financially secure," Blackstone said. "Since my baseball career ended tragically at the age of 14 when I couldn't hit Pony League pitching, this opening is the closest I've come to being invited to an All-Star Game. Plus, the chance to help write a new chapter in the history of the West Virginia Power and build a bright future for professional baseball in my city - count me in!" The West Virginia Power opens its 15th season, and first as an affiliate of the Seattle Mariners, on April 4 in Greenville, S.C., with the home opener slated for April 11 at Appalachian Power Park. The 2019 South Atlantic League All-Star Game will be played in Charleston on June 18. For more information on this hire or to purchase tickets for the 2019 season or All-Star Game, please visit wvpower.com or call (304) 344-BATS.